Trailing Petunias are some of the most popular summer basket plants. Babyplants.co.uk stocks a large range of classic trailing petunias, but we also have some more unusual varieties for you to consider for your hanging baskets this year. Tumbelina Belinda is a variety of double trailing petunia. Belinda produces masses of beautiful dark blue, fully double flowers all summer long. As an added bonus, Belinda’s flowers are fragrant! Trailing petunias are perfect for hanging baskets, providing cascades of colour. 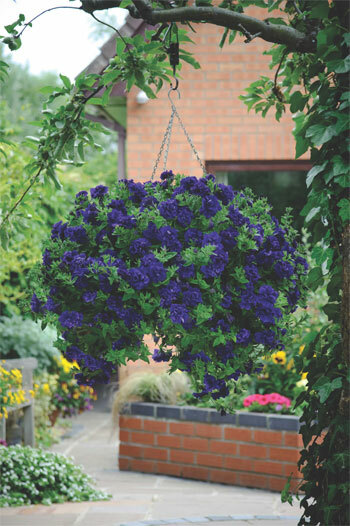 You could try planting Belinda in mixed hanging baskets to provide a wonderful deep colour. However we think that Belinda looks amazing planted together in a hanging basket, as seen in the photograph below. That way you can fully appreciate the gorgeous double flowers and their beautiful scent! To plant a 12” or 30cm hanging basket we would recommend using 3 or 4 Belinda plugs. In the garden, trailing petunias prefer a position in full sun or partial shade. Feed weekly when they are in flower and do not allow them to dry out. Or see our full range of plug plants here.